World#1 Serena Williams on the cover of Fitness Magazine, April 2014. Serena Williams, along with Novac Djokovic on the men’s side, has won the International Tennis Federation’s (ITF) annual World Champion Award, claiming it for a fifth time. Djokovic won Wimbledon for his seventh Grand Slam title and reclaimed the No. 1 ranking. 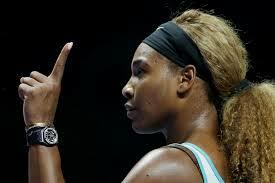 Williams won the US Open for her 18th major championship, the WTA Final in Singapore and stayed No. 1 throughout the year. Serena Williams has always been her own toughest critic; by her standards 2014 had been somewhat of a struggle leading up to the 2014 U, S Open. Up to this point in the season, grand slam titles had evaded the World’s #1: third-round loss at Wimbledon, which followed a second-round loss at the French Open, which followed a fourth-round loss at the Australian Open. 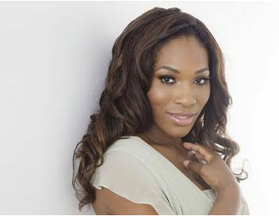 Serena Williams pictured before the 2014 US Open, which she has won five times, including the last two years. This was far from what was expected after a record breaking 2013! Especially when Grand Slam success defines a legacy. Then there was the giant shadow following every step she took in 21014 – the quest to match Chris Evert and Martina Navratilova at 18 grand slam titles, the prestigeous “Elite 18” club. 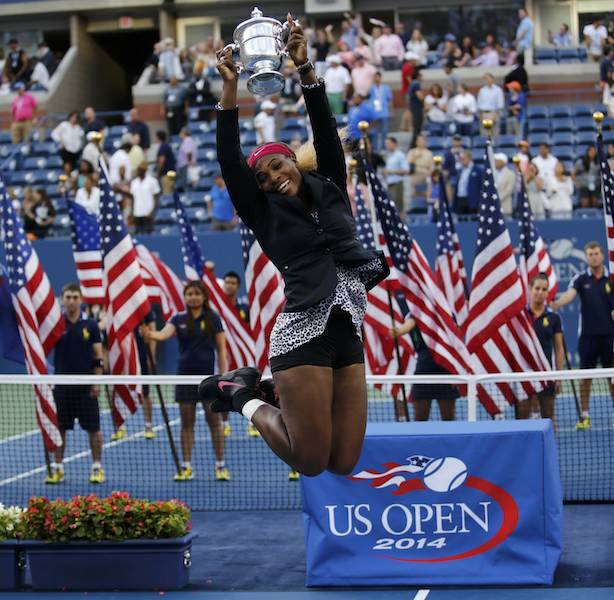 Serena Williams wins in dominant form the 2014 US Open. One more big event remained in 2014, the US Open! Serena obviously had a serious talk with herself because despite all the buzz swirling after her Wimbledon exit – she regrouped, like a shape-shifter in science fiction writing, journeying onto a dominant US Open run! How dominant? Check these results: Serena never dropped more than three games in any set, including a 6-3, 6-3 victory over close gal-pal Caroline Wozniacki in the Sunday final. With outright winners, unreachable groundstrokes and the occasional volley; the oldest woman player, a few months after her 33rd birthday, Serena had serves reaching 120 mph (194 kph) and incredible forceful returns that kept backing her opponent into a corner. American Serena Williams jumps with with joy after defeating Caroline Wozniacki of Denmark in their women’s singles finals match at the 2014 US Open tennis tournament in New York, September 7, 2014. – Reuters pic, September 8, 2014. It’s important not to overlook the significance of this win; her first major trophy of 2014 came at the same event where at age 17, Serena won her 1st title in New York, in 1999. But at this point in her career, one number and one number only mattered to her on this Sunday night, though: 18. What a slam! What a champion! 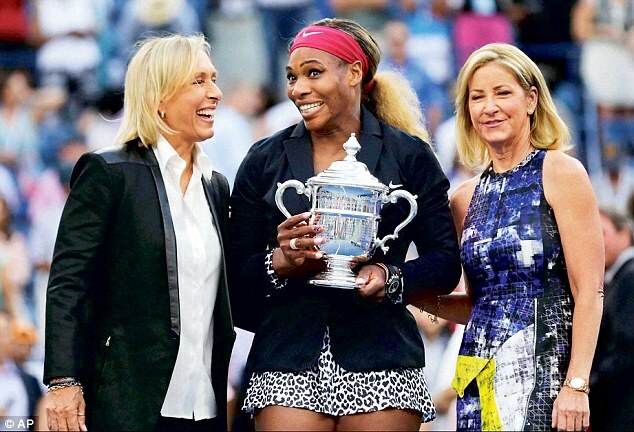 Legends: Serena Williams poses with Martina and Chris as she too claims her 18th Grand Slam Title. Quite emotional was Serena at the conclusion of this match, the world witnessed those moments concluding when she dropped to her back behind the baseline, while covering her face with her hands, joyous as tears flowed in triumph! “I have been trying to reach it for so long, since last year,” said Williams, hoisting her first grand slam trophy since lifting the same trophy a year ago. “I didn’t really think I would get there. I just felt so good.” Serena said. 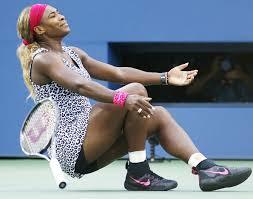 An emotional Serena Williams drops to the court after winning her first grand slam in 2014 win at the US Open. Win represents her 18th Grand Slam Title and membership, along with Martina Navratilova and Chris Evert, in the “Elite 18”. The win was historic in other ways as well: Serena earned $4 million, a record in tennis — $3 million for the title, plus a $1 million bonus for having had the best results during the North American summer hard-court circuit. 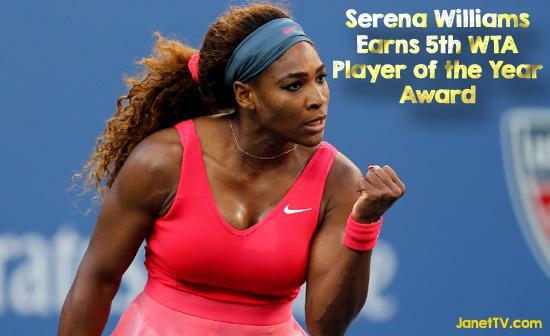 She also became the first female athlete to top $60 million in on-court earnings. Evert and Navratilova joined her on court during the trophy and check ceremony. Selected as the International Tennis Federation’s (ITF) world champions for 2014 Serena won the annual award for a fifth time. 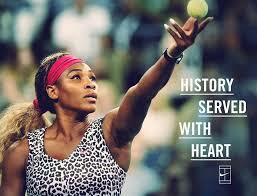 Williams won the US Open for her 18th major championship, the WTA world championship final and stayed No. 1 throughout the year. After her amazing run at the US Open, Serena wasn’t done overwhelming us with her phenomenal style of championship winning. She followed up a surprising loss in the 2014 WTA Championship Final in Singapore, with 26 winners in the final match. Crushing Simona Halep 6-3, 6-0 for her third straight end-of-the-year title. We’re talking only four days after Halep had beaten her; Serena avenged the loss as she came roaring back that Sunday, leaving no room for doubt, that she is still the queen of women’s tennis. This win was the biggest margin of victory in the final of the tournament since Kim Clijsters thrashed Amelie Mauresmo 6-2, 6-0 in 2003. Singapore really captured her heart, naming an orchid after her. 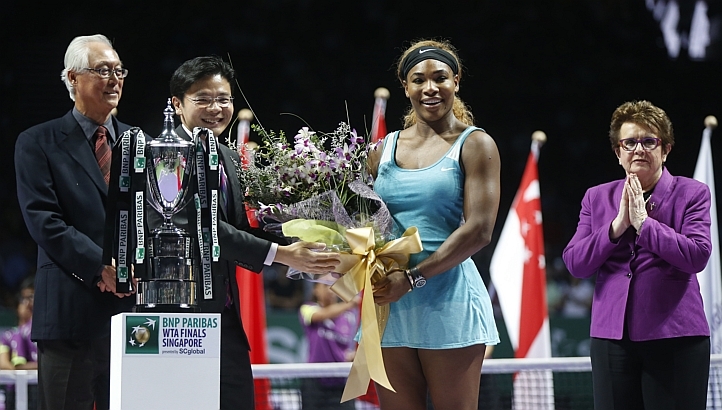 Lawrence Wong, Minister for Culture, Community & Youth & Second Minister for Ministry of Communications & Information, presenting a bouquet of the flowers – to winner Serena Williams. Emeritus Senior Minister Gok Chok Tong & tennis legend Billie Jean King look on during the BNP Paribas WTA Finals Singapore trophy presentation at the Singapore Indoor Stadium on Oct 26, 2014. 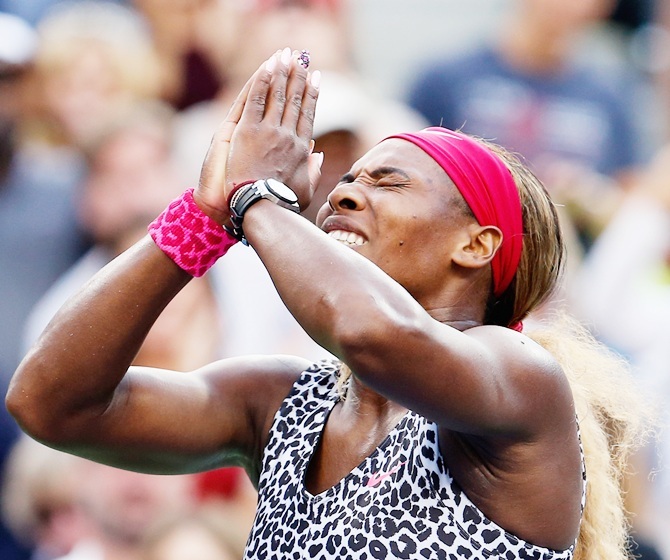 Though her year may have been full of surprises at times – as a whole nobody played better in 2014 – Serena Williams is officially the WTA Year-End World#1. It’s a familiar finish for Serena, having previously done it in 2002, 2009 and 2013. American Serena Williams poses with her WTA Year End World Number One Singles Trophy at the 2014 WTA Year End Gala Party at the Marina Bay Sands Hotel during the BNP Paribas WTA Finals at Singapore Sports Hub on October 25, 2014 in Singapore. She captured seven WTA titles – nobody else won more than four – and among those titles were an historic 18th Grand Slam title at the US Open and the BNP Paribas WTA Finals Singapore, completing a three-peat at the season-ender. Her five other titles came at Premier-level events. And no one has had that long a span – 12 years – between years finishing No.1. Steffi Graf is next with nine years, her first year-end World No.1 finish coming in 1987 and the last one coming in 1996. 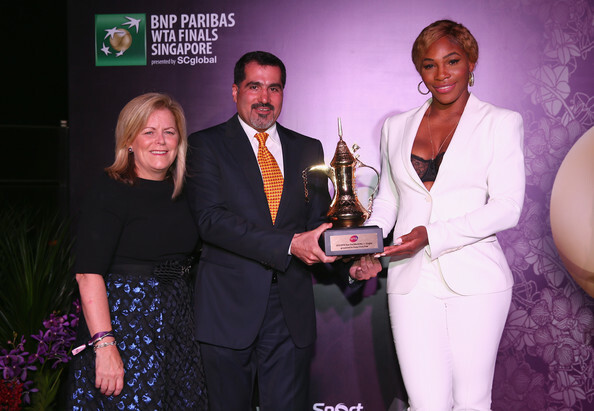 Serena Williams with Stacey Allaster WTA CEO and Chairman, Salah Tahlak from Dubai Duty Free at the WTA Year End Gala Party at the Marina Bay Sands Hotel during the BNP Paribas WTA Finals at Singapore Sports Hub on October 25, 2014 in Singapore. 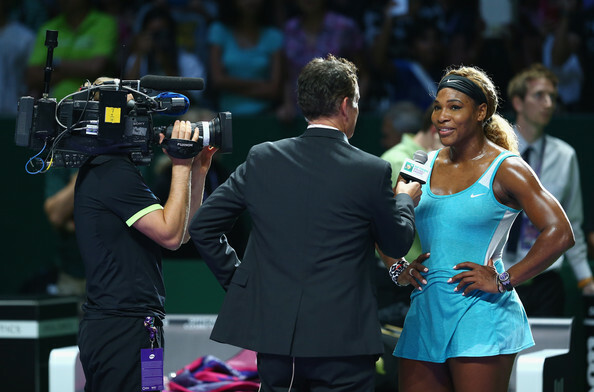 Serena Williams interviewed for television during the BNP Paribas WTA Finals in Singapore. “Gosh, I work so hard on my craft and at what I do, though. There isn’t a day that goes by that I don’t think about being the best. It’s stressful! The only time I didn’t think about it was when I had some problems and I was in the hospital. That was a relief, almost. 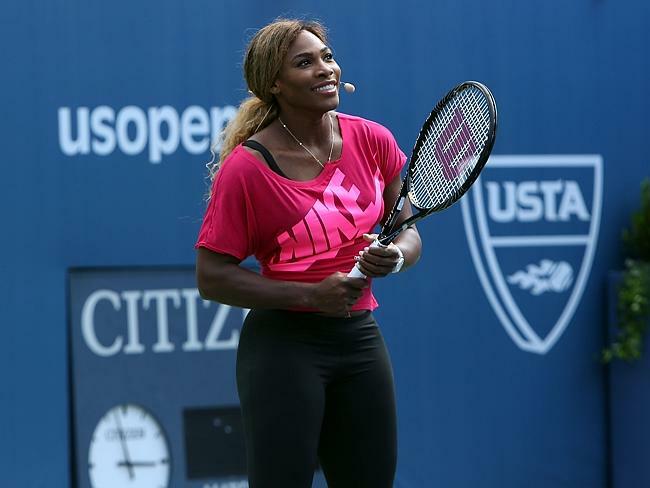 I wasn’t thinking about it.”: Serena Williams. “I think it just really boils down to your personality,” the World No.1 explained. “My personality is I’m a fighter, as you can see, and I never give up. I work very, very hard for everything. Whether it’s my serve or return, I work hard for everything. And it’s good to see some of the results from that. “Thank you Serena for the joy of watching you give your best this year and for exemplifying what perseverance truly looks like … an inspiration you are!